Cantor Fitzgerald is an American financial services firm that was founded in 1945. It specializes in institutional equity, fixed income sales and trading, and serving the middle market with investment banking services, prime brokerage, and commercial real estate financing. It is also active in new businesses, including advisory and asset management services, gaming technology, and e-commerce. It has more than 5,000 institutional clients. Cantor Fitzgerald is one of 22 primary dealers that are authorized to trade US government securities with the Federal Reserve Bank of New York. Cantor Fitzgerald's 1,600 employees work in more than 30 locations, including financial centers in the Americas, Europe, Asia-Pacific, and the Middle East. Together with its affiliates, Cantor Fitzgerald operates in more than 60 offices in 20 countries and has more than 8,500 employees. In 2011, Cantor's affiliate, BGC Partners, expanded into commercial real estate services by its purchase of Newmark Knight Frank and the assets of Grubb & Ellis, to form Newmark Grubb Knight Frank. Cantor Fitzgerald was formed in 1945 by Bernard Gerald Cantor and John Fitzgerald as an investment bank and brokerage business. It later became known for its computer-based bond brokerage, for the quality of its institutional distribution business model, and for being the market's premier dealer of government securities. In 1965, Cantor Fitzgerald began "large block" sales/trading of equities for institutional customers. It became the world's first electronic marketplace for US government securities in 1972 and in 1983, it was the first to offer worldwide screen brokerage services in US government securities. In 1991, Howard Lutnick was named president and CEO of Cantor Fitzgerald; he became chairman of Cantor Fitzgerald, L.P., in 1996. 1 World Trade Center (North Tower), the building with the antenna to the left, included the corporate headquarters of Cantor Fitzgerald. 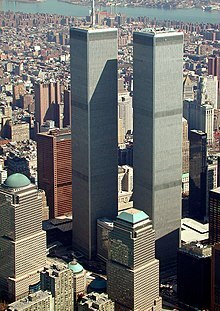 Cantor Fitzgerald's corporate headquarters and New York City office, on the 101st to the 105th floors of One World Trade Center in Lower Manhattan (2 to 6 floors above the impact zone of a hijacked airliner), were destroyed during the September 11, 2001 attacks. At 8:46:46 a.m., six seconds after the tower was struck by the plane, a Goldman Sachs server issued an alert saying that its trading system had gone offline because it was unable to connect with the server. Cantor Fitzgerald lost 658 of its New York employees, 68% of its workforce, which was considerably more than any of the other World Trade Center tenants or the New York City Police Department, the Port Authority of New York and New Jersey Police Department, the New York City Fire Department, or the United States Department of Defense. Lutnick's brother was among those killed as the stairwells below them were destroyed or blocked by the plane crash. Lutnick vowed to keep the company alive, and the company was able to bring its trading markets back online within a week. On September 19, Cantor Fitzgerald made a pledge to distribute 25% of the firm's profits for the next five years, and it committed to paying for ten years of health care for the benefit of the families of its 658 former Cantor Fitzgerald, eSpeed, and TradeSpark employees (profits that would otherwise have been distributed to the Cantor Fitzgerald partners). In 2006, the company had completed its promise, having paid a total of $180 million (and an additional $17 million from a relief fund run by Lutnick's sister, Edie). Until the attacks, Cantor had handled about a quarter of the daily transactions in the multitrillion-dollar treasury security market. Cantor Fitzgerald has since rebuilt its infrastructure, partly by the efforts of its London office, and it now has its headquarters in Midtown Manhattan. The company's effort to regain its footing was the subject of Tom Barbash's 2003 book On Top of the World: Cantor Fitzgerald, Howard Lutnick, and 9/11: A Story of Loss and Renewal as well as a 2012 documentary, Out of the Clear Blue Sky. On September 2, 2004, Cantor and other organizations filed a civil lawsuit against Saudi Arabia for allegedly providing money to the hijackers and Al Qaeda. It was later joined in the suit by the Port Authority of New York. Most of the claims against Saudi Arabia were dismissed on January 18, 2005. In December 2013, Cantor Fitzgerald settled its lawsuit against American Airlines for $135 million. Cantor Fitzgerald had been suing for loss of property and interruption of business by alleging the airline to have been negligent by allowing hijackers to board Flight 11. In 2003, the firm launched its fixed income sales and trading group. In 2006, the Federal Reserve added Cantor Fitzgerald & Co. to its list of primary dealers. In 2009, the firm launched Cantor Prime Services, a provider of multi-asset, perimeter brokerage prime brokerage platforms to exploit its clearing, financing, and execution capabilities. Cantor Fitzgerald began building its real estate business with the launch of CCRE in 2010. On December 5, 2014, two Cantor Fitzgerald analysts were said to be in the top 25 analysts on TipRanks. Edie wrote An Unbroken Bond: The Untold Story of How the 658 Cantor Fitzgerald Families Faced the Tragedy of 9/11 and Beyond. All proceeds from the sale of the book benefit the Cantor Fitzgerald Relief Fund and the charities that it assists. The Cantor Fitzgerald Relief Fund provided $10 million to families affected by Hurricane Sandy. Howard Lutnick and the Relief Fund "adopted" 19 elementary schools in impacted areas by distributing $1,000 prepaid debit cards to each family from the schools. A total of $10 million in funds was given to families affected by the storm. Two days after the 2013 Moore tornado struck Moore, Oklahoma, killing 24 people and injuring hundreds, Lutnick pledged to donate $2 million to families affected by the tornado. The donation was given out in the form of $1,000 debit cards given out to families. Each year, on September 11, Cantor Fitzgerald and its affiliate, BGC Partners, donate 100% of their revenue to charitable causes on their annual Charity Day, which was originally established to raise money to assist the families of the Cantor employees who died in the World Trade Center attacks. Since its inception, Charity Day has raised $110 million for charities globally. Aqua Securities is an alternative trading system for block trades that is currently used by nearly 200 institutions and brokers as an alternative to algorithmic trading of large orders. BGC Partners, named after fixed income trading innovator and founder B. Gerald Cantor, is a global brokerage company that services the wholesale financial markets and commercial real estate marketplace in New York, London, and other financial centers. BGC Partners includes Newmark Grubb Knight Frank, the fourth-largest real estate service provider in the US. Cantor Ventures is the corporate venture capital and enterprise development arm of the company. Led by Henrique De Castro, the group's current investments include delivery.com, Ritani, TopLine Game Labs, AdFin, Lucera, NewsWhip, and XIX Entertainment. Delivery.com is an online destination for consumers to shop in their neighborhood merchants, including local restaurants, grocers, wine and liquor stores, florists, and other retail and service providers. Global Gaming Asset Management is an investment vehicle formed by Cantor and former executives of Las Vegas Sands to invest in, acquire, develop, manage, and advise casino operators and other gaming assets. Hollywood Stock Exchange, founded in 1996, is the world's virtual entertainment stock market. TopLine Game Labs is a technology company to create short-duration fantasy sports and entertainment-based social gaming. Headquartered in Los Angeles, TopLine Game Labs was, in 2013, building a platform-agnostic architecture to power game experiences for sports. An employee, Venetia Thompson, published, in February 2008, an article in The Spectator about her and her colleagues' behavior, with an emphasis on the drinking culture. She was subsequently fired for gross misconduct. She responded in 2010 by publishing a book, Gross Misconduct: My Year of Excess in the City, about her experiences. ^ "Howard Lutnick bio". Retrieved June 15, 2012. ^ "Anshu Jain bio". Retrieved June 15, 2012. ^ "About Us". Cantor Fitzgerald. Retrieved February 6, 2015. ^ "Executive Profile Howard W. Lutnick". Bloomberg Businessweek. February 11, 2015. ^ "office locations." Cantor Fitzgerald. August 9, 2001. Retrieved on October 4, 2009. ^ McCullagh, Declan (November 25, 2009). "Egads! Confidential 9/11 Pager Messages Disclosed". CBS News. Retrieved January 8, 2017. ^ "9/11 hit home for Scott Auker". Manheim Central News. September 11, 2011. Retrieved June 25, 2012. ^ Diebel, Matthew; Cahli, Petra; Navrrao, Bruno; McCartney, Ryan; Bratu, Becky (2010). "Iconic 9/11 figures: Where are they now?". Today.com. NBC. ^ Jessica Pressler (August 27, 2011). "The Encyclopedia of 9/11: Cantor Fitzgerald: The firm that lost the most". New York. ^ David Cohen (September 11, 2009). "Cantor Fitzgerald... the City firm that rose from the 9/11 ashes". London Evening Standard. ^ Glovin, David (January 18, 2005). "Saudi Arabia Wins Dismissal From Sept. 11 Lawsuits (Update1)". Bloomberg. Retrieved October 19, 2012. ^ Benjamin Weiser (December 17, 2013). "Cantor Fitzgerald Settles 9/11 Suit Against American Airlines for $135 Million". The New York Times. Retrieved December 18, 2013. ^ "Cantor Fitzgerald Research Analysts Youssef Squali and Brian White Recognized In TipRanks' Top 25 Analysts on Wall Street Ranking | Cantor Fitzgerald". www.cantor.com. Archived from the original on February 10, 2015. Retrieved May 6, 2017. ^ Lutnick, Edie (September 11, 2012). "Honor the Past By Building a Positive Future". Huffington Post. ^ "Cantor Fitzgerald, Robin Hood Sandy Aid Tops $70 Million". Bloomberg. ^ "Cantor Fitzgerald gives $10M to victims". Crain's New York Business. Bloomberg. Retrieved December 6, 2013. ^ Wells, Jesse. "NEW: NY group in 9/11 makes $1000 donations to May 20th storm victims". KFOR-TV. KFOR. Retrieved December 6, 2013. ^ "$1000 gift cards given". NewsOK. NewsOK.com. ^ "Princes Break Trading World Record As Celebs Raise $12M for Charity". Look to the Stars. September 16, 2013. ^ "Princes Break Trading World Record As Celebs Raise $12M for Charity". Look to the Stars. September 16, 2013. Retrieved March 21, 2017. ^ Dave, Paresh (June 27, 2013). "TopLine gets $25 million to launch short-term fantasy game platform". Los Angeles Times. Tribune. Retrieved December 6, 2013. ^ a b c d "MANAGEMENT TEAM". Cantor Fitzgerald. Retrieved December 6, 2013. ^ Thompson, Venetia (February 6, 2008). "Essex and the City: my life as a 'posh bird' broker". The Spectator. Retrieved October 6, 2016. ^ Thompson, Venetia (February 4, 2010). Gross Misconduct: My Year of Excess in the City. Simon & Schuster, Limited. ISBN 9781847376169.